Palenque é um sítio arqueológico maia situado próximo do rio Usumacinta, no estado mexicano de Chiapas, 130 quilómetros a sul de Ciudad del Carmen. Trata-se de um sítio de média dimensão, menor que Tikal ou Copán, que no entanto contem alguns dos melhores exemplos de arquitectura, escultura e baixos-relevos produzidos pelos maias. As ruínas são formadas por um conjunto de cerca de 500 edifícios que ocupam uma extensão de mais de 15 km. Acredita-se que a civilização maia de Palenque era originalmente liderada por mulheres. Estudos revelam que as ruínas do Templo de La Reina Roja são mais antigas que as do palácio do rei Pacal, o Grande, descoberto em 1950. Junto às ossadas de La Reina Roja foram encontrados anéis, colares, brincos e braceletes, além de uma máscara e uma tiara, ambas feitas de jade. Palenque foi descoberta em 1773 por capitães espanhóis que vinham em busca de madeiras finas como cedro, coaba e chico sapote. Ao começar a explorar a região notaram que as madeiras estavam em cima de edificações antigas. As escavações foram feitas aos poucos. O Templo das Inscrições, por exemplo, onde foram encontrados 3 tabuleiros com 619 hieróglifos, foi descoberto em 1952. Já outros edifícios como o Templo de La Reina Roja e a Tumba dos Mortos, foram descobertos mais recentemente por arqueólogos mexicanos, em 1994 e 1993, respectivamente. Carrasco, Michael D. (2005). The Mask Flange Iconographic Complex [electronic resource]: The Art, Ritual, and History of a Maya Sacred Image. Doctoral dissertation, The University of Texas at Austin. Available electronically from http://hdl.handle.net/2152/1027. Carrasco, Michael D. and Kerry Hull (2002) The Cosmogonic Symbolism of the Corbeled Vault in Maya Architecture. Mexicon Volume XXIV, No. 2, April. Fields, Virginia M. (1991) Iconographic heritage of the Maya Jester God. In Sixth Palenque Round Table, 1986. Virginia M. Fields, ed. pp. 167 - 174 Palenque Round Table (6 session, 1986) University of Oklahoma Press Norman. Freidel, David and Barbara Macleod (2000) Creation Redux: new thoughts on Maya cosmology from epigraphy, iconography, and archaeology. PARI Journal 1(2):1-8,18. Houston, Stephen (1996) Symbolic Sweatbaths of the Maya: Architectural Meaning in the Cross Group at Palenque, Mexico. Latin American Antiquity, 7(2), pp. 132-151. Kelley, David (1965) The Birth of the Gods at Palenque. In Estudios de Cultura Maya 5, 93-134. México: Universidad Nacional AutÛnoma de Mexico. Lounsbury, Floyd G. (1976) A Rationale for the Initial Date of the Temple of the Cross at Palenque. In The Art, Iconography, and Dynastic History of Palenque, Part III: Proceedings of the Segunda Mesa Redonda de Palenque, ed. Merle Greene Robertson, 211-224.Pebble Beach, Ca. : Robert Louis Stevenson School. Lounsbury, Floyd G. (1980) Some Problems in the Interpretation of the Mythological Portion of the Hieroglyphic Text of the temple of the Cross at Palenque. In The Third Palenque Round Table, 1978, Part 2, ed. Merle Greene Robertson, 99-115. Palenque Round Table Series Vol. 5. Austin: University of Texas Press. Lounsbury, Floyd G. (1985) The Identities of the Mythological Figures in the "Cross Group" of Inscriptions at Palenque. In Fourth Round Table of Palenque, 1980, vol. 6, gen. ed. Merle Greene Robertson; vol. ed., Elizabeth P. Benson, 45-58. San Francisco: Pre-Columbian Art Research Institute. Rands, Robert L. and Barbara C. Rands (1959) The Incensario Complex of Palenque, Chiapas. American Antiquity, 25 (2):225-236. Rands, Robert L., Ronald L. Bishop, and Garman Harbottle (1979) Thematic and Compositional Variation in Palenque Region Incensarios. In Tercera Mesa Redonda de Palenque, Vol. IV, edited Merle Greene Robertson and Donnan C. Jeffers, 19-30. 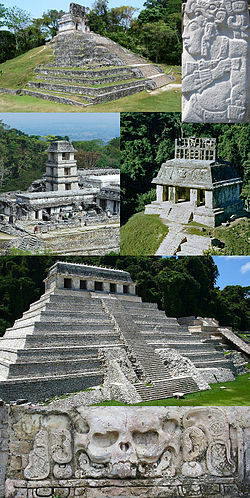 Palenque: Pre-Columbian Art Research, and Monterey: Herald Printers. Robertson, Merle Greene (1991) The Sculpture of Palenque Vol. IV. Princeton University Press, Princeton. Ruz, Alberto Lhuillier (1958) Exploraciones arqueológicas en Palenque: 1953. Anales del Instituto Nacional de AntropologÌa e Historia. Vol. 10(39):69-116. Mexico. Sáenz, César A. (1956) Exploraciones en la Pirámide de la Cruz Foliada. Informe 5. Dirección de Monumentos Prehispánicos. Instituto Nacional de AntropologÌa e Historia, Mexico. Scarre, Chris (1999) The Seventy Wonders of the Ancient World. Thames and Hudson. Schele, Linda (1976) Accession Iconography of Chan-Bahlum in the Group of the Cross at Palenque. In The Art, Iconography, and Dynastic History of Palenque, Part III. Proceedings of the Segunda Mesa Redonda de Palenque, ed. Merle Greene Robertson, 9-34. Pebble Beach, Ca. : Robert Luis Stevenson School. Schele, Linda (1979) Genealogical Documentation in the Tri-Figure Panels at Palenque. In Tercera Mesa Redonda de Palenque, Vol. IV, edited Merle Greene Robertson, 41-70. Palenque: Pre-Columbian Art Research, and Monterey: Herald Printers. Schele, Linda (1985) "Some Suggested Readings of the Event and Office of Heir-Designate at Palenque". In Phoneticism in Mayan Hieroglyphic Writing, 287-307. Albany: Institute of Mesoamerican Studies, State University of New York at Albany. Schele, Linda (1986) "Architectural Development and Political History at Palenque". In City-States of the Maya: Art and Architecture, edited Elizabeth P. Benson, 110-138. Denver: Rocky Mountain Institute for Pre-Columbian Studies. Schele, Linda (1992) Notebook for the XVIth Maya Hieroglyphic Writing Workshop at Texas. Austin, Texas: University of Texas at Austin. Stuart, David and Stephen Houston (1994) Classic Maya Place Names Studies. Pre-Columbian Art and Archaeology, 33. Washington, D.C.: Dumbarton Oaks Research Library and Collection. Archaeology of Native North America, 2010, Dean R. Snow, Prentice-Hall, New York. pp. Esta página foi editada pela última vez às 23h29min de 14 de abril de 2019.